Conveniently accessible from the airports, Kalyon Hotel Istanbul is a (4) four-star boutique hotel ideally located in the center of Sultanahmet, the historic Peninsula of Istanbul. Find yourself within walking distance to the city’s landmarks such as the Blue Mosque, Hagia Sofia, Covered Bazaar and Topkapi Palace. Directly on the shores of the Sea of Marmara, the hotel also boasts stunning sea views from which to observe passing ships making their way along the ancient sea route that divides two continents, and connects the Mediterranean and the Black Sea. Very frequently, and depending on the seasons, the ships are accompanied by schools of dolphin that dive majestically through the calm waves. Whether you crave international cuisine or authentic Turkish cuisine, let your taste buds take a delightful culinary journey at our restaurant, popular with locals. The restaurant Falyanos by Kalyon and open-air Terrace Café & Bar create the perfect setting with their modern decoration and calming sea views. Above all, what truly makes stays memorable at Kalyon is our culture, our people and our unrivaled passion for providing genuine service straight from our hearts. The best of Turkish hospitality rooted in each of our staff has proudly come alive in our charming 4-star hotel over 50 years. 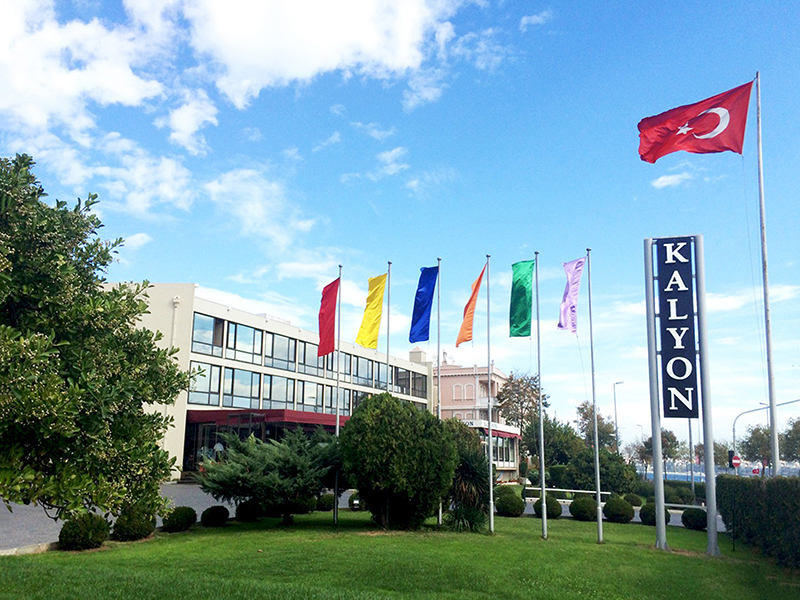 Kalyon Hotel Istanbul is a member of TUROB and ICVB. The Hotel is owned by Kalyon Otelcilik Turizm Pazarlama A.Ş. and managed by Professional Divisions. best manner in comfortable, modern and safe secure environment. * We consider our visitors at Kalyon not as customers but rather as respectable and valuable guests. and services at Kalyon, and make sure that they feel the distinction of Kalyon at all the times. * We work as a team at Kalyon and regard other employees as members of the team. regardless of conditions under whatever circumstances. * We emphasize 3 values in all our relationships at Kalyon: Respect, Courtesy, and Cordiality. contribute to ourselves, our team members and our company. * We embrace honesty, integrity and respect towards people as our core values at Kalyon.